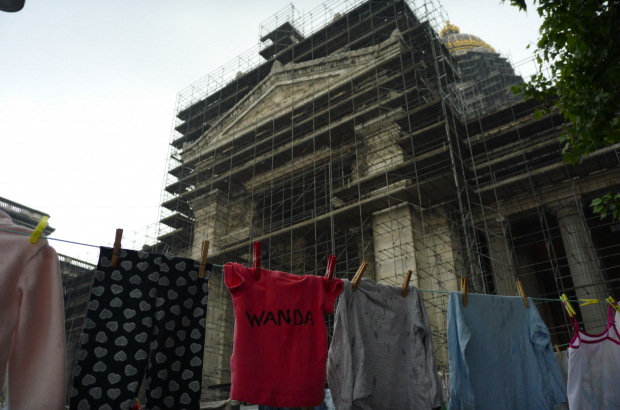 Demonstrators hung toys and children's clothes from a washing line outside Brussels' Justice Palace in a protest against the killing of a two-year-old Kurdish girl during a police chase. About 600 people gathered on Place Poelaert on Wednesday evening to condemn the Belgium federal government's migration policy, according to a police estimate. Protestors carried signs calling for the resignation of interior minister Jan Jambon and migration minister Theo Francken and a minute's silence was held. Two-year-old Mawda Shawri died after being hit by a stray police bullet last week. The shooting occurred during a police chase with a van operated by human traffickers on the E42 motorway between Namur and Mons. Some 29 Kurdish migrants were found in the back of the van. They were heading for the UK. Mehdi Kassou, from the Citizen's Platform for the Support of Reguees, said his organisation had provided housing and counselling to the bereaved family. Gulistan Ozer, a representative of the Kurdish community in Belgium, told reporters: "Mawda did not die under a shower of bombs in Iraq. She did not drown in the Mediterranean. She died under the bullets of the Belgian police. "During their long and painful journey, her parents never abandoned her. Now they are asked to leave their daughter's body in Belgium and exit the country. Today, I am ashamed to be Belgian." There is not enough information in this story to form an opinion on anything. I would say that the Belgian Police were justified in the shooting, that they were under fire, and had no way of knowing a small child was in the vehicle. I believe that the "Kurds" are the ones who are guilty of murder...and that is that. How do you come to the conclusion that police were justified? From the little I know there were over a dozen police cars following this vehicle, a vehicle that would eventually stop.